The Indian Space Research Organisation (ISRO) has successfully conducted on Thursday, Sept. 8, its fifth mission of the year, by lofting its advanced weather satellite named INSAT-3DR. 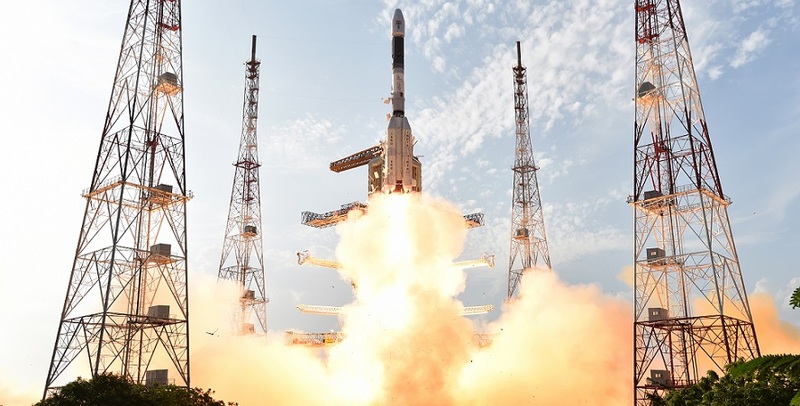 The spacecraft was launched atop a Geosynchronous Satellite Launch Vehicle (GSLV), from the second launch pad at the Satish Dhawan Space Centre in Sriharikota, India. ISRO’s Mission Readiness Review (MRR) committee and Launch Authorization Board (LAB) cleared the mission - designated GSLV-F05 - for the launch on Monday, Sept. 5, giving green light for the start of the final pre-launch preparations. The 29-hour countdown for the mission, commenced on Wednesday, Sept. 7, at 11:10 a.m. local time (1:40 a.m. EDT, 5:40 GMT), enabling the teams to perform lasts checks and fueling operations. Lifting off at exactly 4:40 p.m. local time (7:20 a.m. EDT, 11:20 GMT), the GSLV launch vehicle started its short vertical ascent, before it turned east, towards the Indian Ocean. The rocket’s first stage consisting of the core stage powered by one S139 engine and four liquid strap-on boosters fitted with one L40H Vikas 2 engine each, lofted the vehicle to an altitude of about 45 miles (72 kilometers). Two and a half minutes after liftoff, the GS2 Vikas 4 engine of the second stage took control over the flight. At T+3:48 minutes, the protective payload fairing was detached from the vehicle, unveiling the mission’s sole passenger. The second stage burned out about four minutes and 49 seconds after launch and was separated three seconds later. Afterwards, almost immediately, the rocket ignited its Cryogenic Upper Stage (CUS), equipped in an Indian cryogenic engine named CE-7.5. CUS continued the flight for the next 12 minutes until its burnout. The satellite was deployed at an altitude of 143 miles (230 kilometers) into a geostationary transfer orbit (GTO), 17 minutes and four seconds after launch. The spacecraft will now use its own propulsion system to reach a geosynchronous orbit (GEO) at an altitude of about 22,370 miles (36,000 kilometers) to be stationed at 74 degrees East longitude. The mission’s passenger, INSAT-3DR, weighs about 2.2 metric tons and has dimensions of 7.9 by 5.25 by 4.9 feet (2.4 by 1.6 by 1.5 meters). It is an advanced meteorological satellite based on ISRO’s I-2K bus. The satellite consists of light-weight structural elements like Carbon Fibre Reinforced Plastic (CFRP) and features one solar array, capable of generating up to 1,700 watts of power. The spacecraft is expected to be operational for up to 10 years. The spacecraft’s multi-spectral imager is capable of acquiring images of Earth in six wavelength bands significant for meteorological observations. It will produce images of the planet every 26 minutes, providing various parameters like outgoing long-wave radiation, quantitative precipitation estimation, sea surface temperature, snow cover, and cloud motion winds. The GSLV that was used in Thursday’s mission is an expendable launch system developed to enable India to launch its satellites without dependence on foreign launch service providers. It uses major components that have already been proven by the Polar Satellite Launch Vehicle (PSLV) launchers in the form of the S125/S139 solid rocket booster and the liquid-fueled Vikas engine. The overall length of the launcher is 161 feet (49 meters) with a liftoff mass of 415 metric tons. Thursday’s launch featured the GSLV rocket in ‘Mk II’ variant. This version of the rocket uses India’s CE-7.5 cryogenic engine and it is capable of launching 2.5 metric tons into GTO. Previous GSLV vehicles (GSLV Mk I) have used Russian cryogenic engines. The mission also includes the CUS upper stage that is more efficient and provides more thrust when compared to solid and earth-storable liquid propellant rocket stages. GSLV-F05 is the tenth flight of the GSLV booster. The maiden launch of the GSLV (GSLV-D1) was conducted April 18, 2001. That flight carried GSAT-1, however the satellite failed to reach the correct orbit. Attempts to save the spacecraft by using its onboard propulsion system to maneuver it into the proper orbit were also unsuccessful as it ran out of fuel several thousand miles below geosynchronous orbit. Last GSLV mission took place more than year ago, on Aug. 27, 2015, when it orbited the GSAT-6 communications satellite. However, ISRO’s plans for the future include more frequent exploitation of this booster. “From now on the target is for two GSLV launches a year, which means a launch every six months. It took us a year between the last one and this. We want to improve that. Currently we are looking forward to streamlining and making the GSLV operational,” said ISRO Chairman A.S.Kiran Kumar. Currently, next GSLV launch is scheduled for May 2017. It will carry the GSAT-9 communications satellite into space. Thursday’s liftoff was the fifth orbital mission for India in 2016, and so far all this year’s flight were successful. The country’s next launch is currently scheduled for Sept. 26, when a PSLV rocket will take to the skies, lofting six Indian spacecraft and two Earth-observing satellites for the U.S. company BlackSky Global.